Offering you a complete choice of products which include linear bearing bushes and linear bushes. 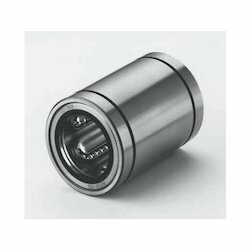 We are a leading manufacturer and supplier of Linear Bearing Bushes. With our rich industry experience, we provide a supreme quality range of Linear Bushes. These linear bushes are widely used in automobile and other engineering industries for reducing the size and weight of linear motion part of machines. The offered linear bushes are manufactured using high-quality metal and latest technology keeping in mind set industry norms. Tested on different parameters, these linear bushes are superior in finish and resistant to corrosion which makes this highly acclaimed among our clients. Type LME: This is the metric dimension series used most frequently in Europe. Type LMB: This is the inch dimension series used mainly in the USA. 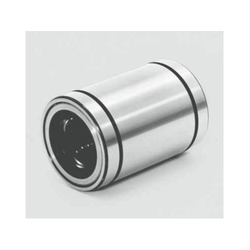 This type has the same dimensions as the standard type, but as the outer sleeve is slotted in an axial direction, it can be used for installation in a housing with adjustable inner diameter, so that the clearance with the shaft can be adjusted easily. High-quality special shafts for the linear bush type LM is stocked in large numbers, and delivery is possible in short time. As shown in the photo, hollows shafts and shafts with end machining also are produced on request. Looking for Linear Bushes ?